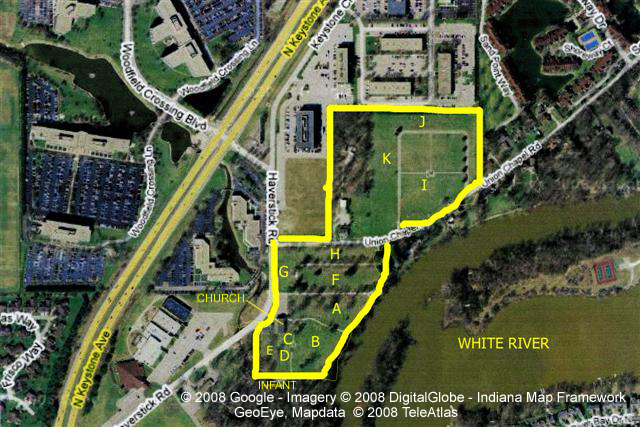 This section allows the viewer to determine the location of the lots in each section. To see a lot map for any section, just double-click on that section in the aerial view below and the lot map for that section will appear on your screen. You may then need to zoom with your browser to read some of the lot numbers on the map. Each section of the Cemetery is divided into lots and the lots are then divided into individual gravesites. Normally, there are three gravesites in each lot but, due to roads, walkways, trees, etc. and anticipated lot-owner needs, the number of gravesites included in a lot can vary from one to five. Both full lots and individual gravesites may be purchased. copyright 2009 - Union Chapel Cemetery Association, Inc.